Timeless Design Custom Made for You. Huerta Furniture is a family-run custom furniture making business serving all of Southern California since 1996. We pride ourselves in our honest craftsmanship, hospitable customer service, and unbeatable value and efficiency. Absolutely any piece of furniture can be designed and customized, all with unsurpassable style and luxe comfort. From sectional sofas and chaise loungers to pull-out beds and armchairs, if you desire it we will build it. Our design team can help you create a piece that is uniquely yours and customizable down to the most minute details such as leg style and spacing of buttons or nail heads. Our warehouse offers samples of hundreds of fabric options and colors to choose from so there is no need to imagine with a mere photo. We understand furniture makes an impressive statement in any given space and we are dedicated to making sure your design ideas are exactly what you want. You will never feel rushed or pressured in your customizing process. We will work with you to design and redesign until you are satisfied with your creation. Our pricing is unmatched for custom furniture at this caliber. We take great pride in the product we produce and we make sure you are proud to own it as well. 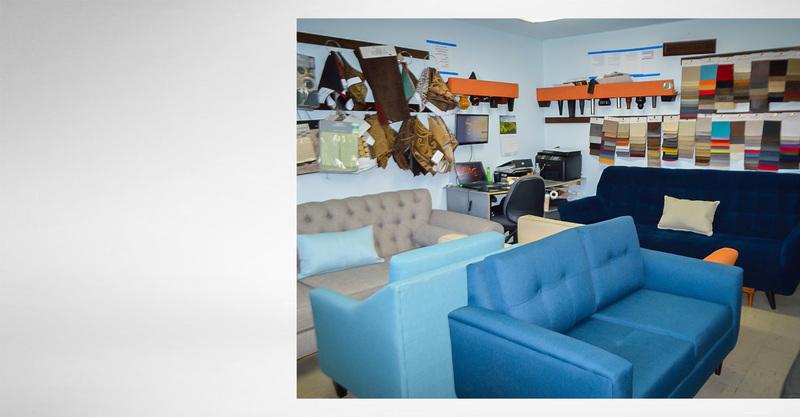 Our customers can look forward to having their brand new, entirely customized furniture within a two-week period. Come visit our office in South El Monte and see all the endless options available to you. I had been looking everywhere for a reasonably priced modern couch with a chaise -- and decided to place a custom order with Huerta Furniture. I cannot be happier with the end result! The couch is very well-made and is exactly what I was looking for. The couch was done and delivered in a week!! It looks just as good as a high-end retailer such as West Elm -- I get tons of compliments from friends who visit my apt! We love our new sectional! Got it with plenty of time for the Super Bowl and had tons of seating for everyone. The craftsmanship is fantastic, and it was made exactly how we wanted it. We couldn't be happier with our new sofa! I love my new sofa! I just bought it from these guys, I picked out the fabric, the style and the foam density, and I can't believe how nicely it turned out, and for a reasonable price. Great Job! It was our first time ever customizing a sofa, so we really did not know what were were doing. Eddy was a BIG help, he was great, he is always willing to help, easy to talk to and very patient! We had tons of questions and went through tons of options. He was always calm & collected and did not rush us or push us to make a decision. We are very grateful for that! Eddy is a great asset to the team there, can't thank him enough. I purchased my custom made sofas a few months back although there were some adjustments to be made I am now completely satisfied!! My sofas are absolutely beautiful and exactly what I wanted!! I give them five stars because they have amazing customer service Eddie was amazing I really appreciate his patience, professionalism and punctuality! Love my couches. I was presented options such as different upholstery colors, cushion styles, fill, and couch legs for a set in stock that the shop could do on the spot and deliver a couple days later. I just was just a walk-in after a yelp search and had a one-on-one chat to walk through their models. Satisfied with the product and options. Get the custom designed sofa and chair you've been looking for. Give us a call or request a quote using our online form and we'll assist you in creating your prefect sofa.